Most operations are delegated to the symbolic state. The return value from the symbolic state is replaced with an unknown if the expression grows beyond a certain complexity. Definition at line 217 of file Semantics.h. Instantiate a new RiscOperators object and configure it using default values. Definition at line 261 of file Semantics.h. References Rose::BinaryAnalysis::Partitioner2::Semantics::MemoryState< Super >::instance(), Rose::BinaryAnalysis::InstructionSemantics2::BaseSemantics::RegisterStateGeneric::instance(), Rose::BinaryAnalysis::InstructionSemantics2::SymbolicSemantics::SValue::instance(), Rose::BinaryAnalysis::InstructionSemantics2::BaseSemantics::State::instance(), Rose::BinaryAnalysis::Partitioner2::LIST_BASED_MEMORY, and Rose::BinaryAnalysis::Partitioner2::MAP_BASED_MEMORY. Instantiate a new RiscOperators object with specified prototypical values. Definition at line 280 of file Semantics.h. 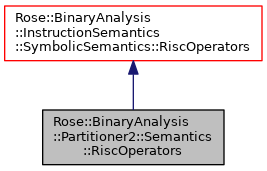 Instantiate a new RiscOperators with specified state. Definition at line 286 of file Semantics.h. Definition at line 294 of file Semantics.h. Definition at line 300 of file Semantics.h. Run-time promotion of a base RiscOperators pointer to our operators. This is a checked conversion–it will fail if x does not point to our object. Definition at line 311 of file Semantics.h.